Your private villa has a year-round outdoor pool, and guests can enjoy a drink at the bar. Free WiFi is available throughout the property and free private parking is available on site. Every room at this resort is air conditioned. The living room is equipped with a flat-screen TV with satellite channels, Blu-ray player and DVD player. All rooms feature a terrace or balcony and a seating area for your convenience. The rooms are fitted with a private bathroom with a shower and bidet, with free toiletries provided. The Villa and gardens are multilevel, this means not accessible for wheelchairs and small children should be closely watched. 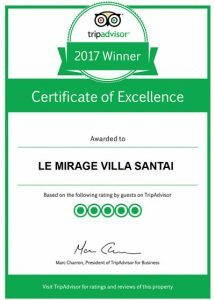 Elderly guests particularly love the serenity of the villa and need to manage a few steps at least. We have bar services available. Car parking is free. The infinity pool is 18 meters x 5 meters and perhaps the largest swimming pool of any private villa on Bali island, serviced for you every day. Certified scuba dive course instructions (PADI or SSI) are continuously enjoyed by our guests in the pool. Pool towels, toys, etc. are free. There is also CCTV for added security. You will find a Lounge/TV/Games Room where you can play games and watch TV, facilities include PS3 & games, board games, kids movies, etc.. This estate has some water sports facilities. Bike, motor bike (scooter) or car hire is available. The nearest airport is Ngurah Rai International Airport Denpasar, approx. 85 km from the property.